For those familiar with my old YouTube series, New in the Store, you will be excited to know that I am starting something very similar here on NextReality that's a bit more broad in scope. Have You Seen This? will take a look at HoloLens applications that are new in the Windows Store, as well as some that may not have gotten the attention they deserve. For those who don't know, I tend to go out of my way to know very little about a HoloLens application before using and recording it. Having little beforehand knowledge allows an organic approach to learning how the software works. It's also sometimes funny to watch as I stumble my way through it. As a big proponent of user experience (UX), it is a great test in that regard. The first application that I'm checking out here is called Holo Space Invaders, by Mengsoftware, which appeared in the Windows Store a few days ago at a $2.99 price tag. If the name is any indicator, I suspect there will be spaceships attacking. Holo Space Invaders is cool in concept and simple in execution. The star field looks and feels great, though, this part does not translate well in the video above. The ships look good, and the explosions look great. This could be a fun project once Mengsoftware puts more time and effort into it. The art and sound work well together in creating the atmosphere Mengsoftware is aiming for. The ship movements look good. The interface is really simple (though, maybe too simple?). While it is cool to watch spaceships fly around my office, this is also my main critique of the project. Using gaze as the sole point of interaction makes a project feel... well, more like watching a movie than playing a game. There is really not enough here yet to put in a full review. Ships flying straight at the user's face can be a bit bothersome. This last part is likely a bug, but there is apparently a radar in the lower corner that I could not see the whole time. If crowdsourcing to have a game made is one end of a spectrum, and releasing a game and patching bugs is the other, then publishing and selling a minuscule portion of a project to add to later is somewhere in the middle. As a consumer, when someone asks for money in exchange for a product, unless expressly said upfront in the purchase process, I expect that product that have a bit more to chew on it. 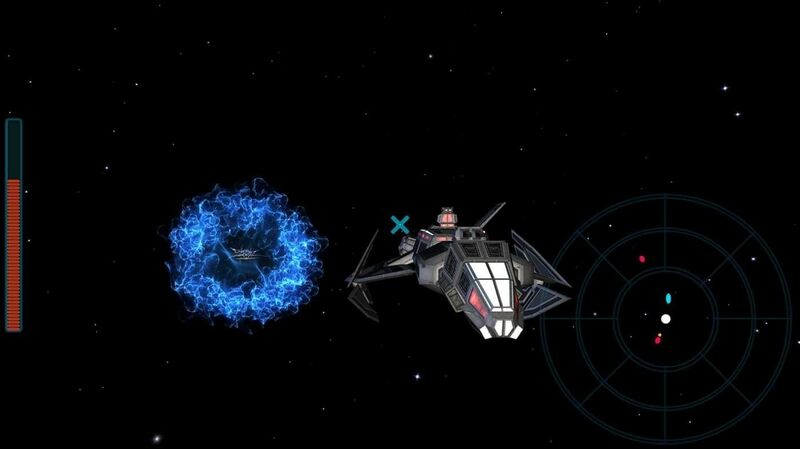 One could draw some comparisons in style to a Dangling Concepts' Holo Raid, which is a free HoloLens game in the Windows Store, but Mengsoftware has some work to do to get to that point. If you were to ask if you should pay $2.99 for the game, I would say wait until it's further along. That said, with some more meat and maybe some other ways to interact, this could be a fun addition to the Windows Store for HoloLens. I will keep checking back as I see updates happen and will update accordingly. What's your favorite recent HoloLens addition to the Windows Store? What apps are you working on? Share with us in the comments or on social media at the links below. Thanks for sharing! I really like your posts. Is the music from the game or something you added to the video? Were there audio cues to tell you the position of the starships (i.e. should you turn left or right)? Does HoloLens support directional audio? Thanks! The music is something I put in the video to cover the spaces when I don't speak. The HoloLens uses what they call Spatial Sound it is a pretty accurate 3D directional sound. Mengsoftware did make use of it for this game.